The ability to sense the Earth’s magnetic field—a trait known as magnetoreception — is well documented among many animals, but researchers have struggled to show that humans are also capable of the feat. Until now. 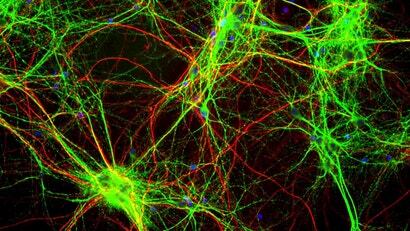 New experimental evidence published today in the science journal eNeuro suggests the human brain is capable of responding to the Earth’s magnetic field, though at an unconscious level. It’s not clear if our apparent ability to sense the magnetic field is in any way useful, as it’s likely a vestigial trait left over from our more primitive past. Giving the new finding, however, researchers should investigate further to determine if magnetoreception is somehow contributing to our behaviour or abilities, such as spatial orientation. Magnetoreception is found among both invertebrates and vertebrates, and it’s probably a capacity that’s been around for a very long time. Some bacteria and protozoans exhibit magnetoreception, as do some migratory birds and sea turtles, who use the added sense to assist with navigation. Dogs are also sensitive to the Earth’s magnetic field, orienting their bodies along the North-South axis when they poop. Around 30 years ago, scientists tried to determine if humans have a similar capacity, but to no avail. These pioneering efforts produced results that were either inconclusive or unreproducible, so scientists largely gave up, figuring magnetoreception is something outside the human realm. In the years that followed, work on animals increasingly pointed to magnetoreception as the result of complex neurological processing—a possibility that motivated Caltech geophysicist Joseph Kirschvink and neuroscientist Shin Shimojo to revisit the issue. To test whether the human brain is capable of magnetoreception, and to do so in a reliable, believable manner, Kirschvink and Shimojo set up a rather elaborate experiment involving a chamber specially designed to filter out any extraneous interference that might influence the results. The isolated chamber, within which participants had their brainwaves monitored by electroencephalogram (EEG), was housed inside a Faraday Cage, which shielded all interior contents from external electromagnetic fields. 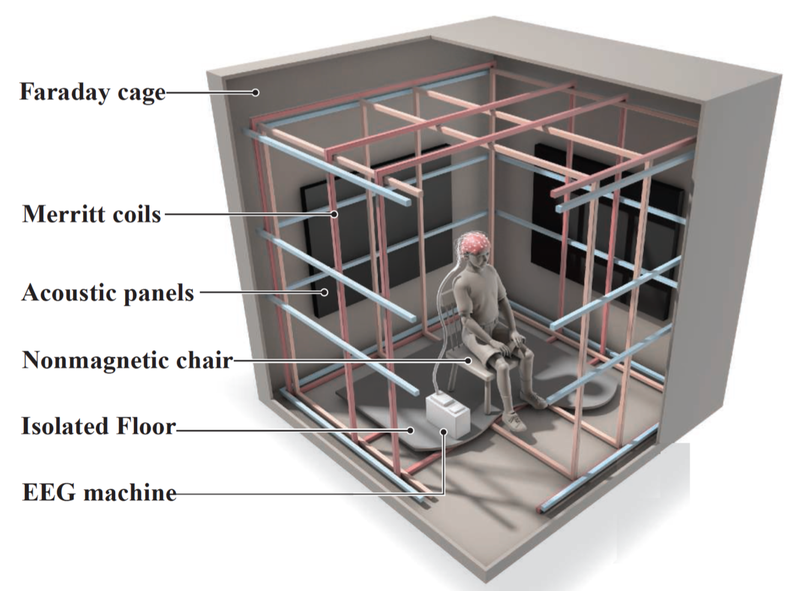 Three orthogonal sets of square coils, called Merritt coils, allowed the researchers to control the ambient magnetic fields around a participant’s head. Acoustic panels on the wall reduced external noise from the building, while a wooden chair and isolated floor prevented any unwanted interference with the magnetic coils. A battery-powered EEG was placed next to the participant, which was connected to a computer in another room with an optical fibre cable. During carefully controlled experiments, participants sat upright in the chair with their heads positioned near the center of the magnetic field, while EEG data was collected from 64 electrodes. The hour-long tests, in which the direction of the magnetic fields were rotated repeatedly, were performed in total darkness. The experiment involved 34 adult volunteers, who collectively participated in hundreds of trials; all tests were done in a double blind manner, and control groups were also included. After the experiments, none of the participants said they could tell when or if any change to the magnetic field had occurred. But for four of the 34 participants, the EEG data told a different story. As noted in the new study, the researchers recorded “a strong, specific human brain response” to simulated “rotations of Earth-strength magnetic fields.” Specifically, the magnetic stimulation caused a drop in the amplitude of EEG alpha waves between 8 and 13 Hertz — a response shown to be repeatable among those four participants, even months afterward. Two simple rotations of the magnetic field appeared to trigger the response — movements comparable to a person nodding their head up or down, or turning it from left to right. The alpha rhythm is the dominant brain wave produced by neurons when individuals aren’t processing any specific sensory information or performing a specific task. When “stimulus is suddenly introduced and processed by the brain, the alpha rhythm generally decreases,” the authors wrote. The researchers don’t know how the human brain is able to sense magnetic fields, but Kirschvink has a favourite theory. There may be “specialised sensory cells that contain tiny magnetite crystals,” he said, which is currently “the only theory that explains all of the results, and for which there is direct physiological data in animals.” Back in 1992, Kirschvink and his colleagues isolated crystals of biogenic magnetite from human brains, so he may be onto something; other researchers should now dive into this possibility to flesh this idea out. Looking ahead, Kirschvink would like to better understand the biophysics of this capacity, including measuring threshold sensitives. Shimojo believes it might be possible to bring magnetoreception into conscious awareness, a possibility that could spawn entirely new directions of research. Imagine, for example, if future humans had a built-in compass, allowing them to sense magnetic north. Michael Winklhofer from the Institute of Biology and Environmental Sciences at Carl von Ossietzky University of Oldenburg, liked the new study, saying the authors “did everything to rule out artifacts [noise] which could easily occur during recording electrical brain activity in a changing magnetic field.” Also, the description of the setup and methods was so detailed that the study can be easily replicated, he said. 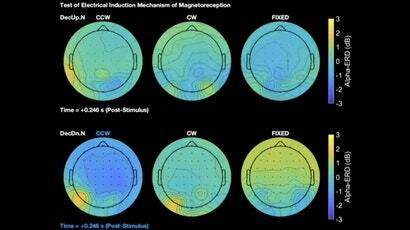 “For the first time in humans, clear responses to magnetic field changes were observed. Even though the magnetic field was not consciously perceived in the test persons that showed brain responses to the field, the study invites [other scientists] to follow up research to understand the mechanism by which the magnetic field elicits neuronal activity,” Winklhofer told Gizmodo. “It is one thing to find a subtle change in brain activity in response to a weak magnetic field, and another thing to show that people really detect and use magnetic field information in a meaningful way,” said Lohmann. Indeed, for now we’ll have to be content with the observation that human brains can detect magnetic waves, and leave it at that. Researchers will now have to figure out why human magnetoreception exists, and if this capacity somehow extends to our behaviour. Regardless, we can look forward to some exciting new science in the future.